Help Make it a Happy Kitmas. During December the club will be collecting any unwanted sports kit. Just drop off your donations of sports clothing or equipment to the WFC office or in to the collection bins on the stage in the clubhouse. 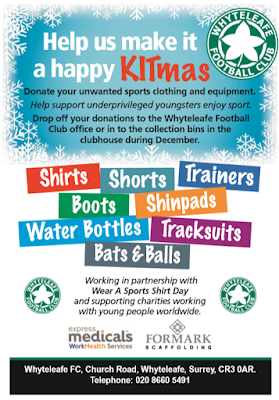 The clothing and equipment will be donated to Wear A Sports Shirt Day, which will distribute it to charities working in the UK and throughout the world to get underprivileged young people involved in sport. 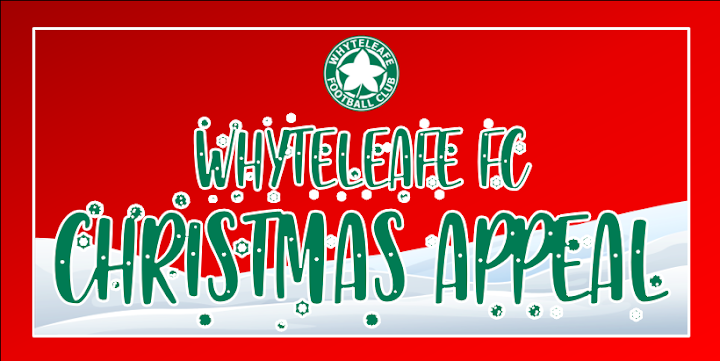 “We’ve all got unwanted sports clothing tucked away in cupboards and draws that’s either too small, got the wrong logo on or simply not needed because Santa’s bringing new kit,” said WFC Vice Chairman Clive Davis. “This is a great opportunity to have a clear out and to help others less fortunate than us. Shirts, shorts, socks, tracksuits, hooded tops, rain jackets, boots and trainers, water bottles, shin pads and balls can all be found grateful new owners. Youngsters who would otherwise never have the means or opportunity to wear the right gear or play with the right equipment. Charities benefitting include KitAid, Kits4Causes, Africa on the Ball, Thembalethu Foundation and SOS Kit Aid (rugby), as well as projects that work with schools / children such as Bags of Hope & Operation Sunshine. The appeal is being backed by club sponsors Express Medicals and Formark Scaffolding, both of which will be highlighting the initiative to customers and clients during December. If you would like a poster to help us publicise the appeal please contact the club office.